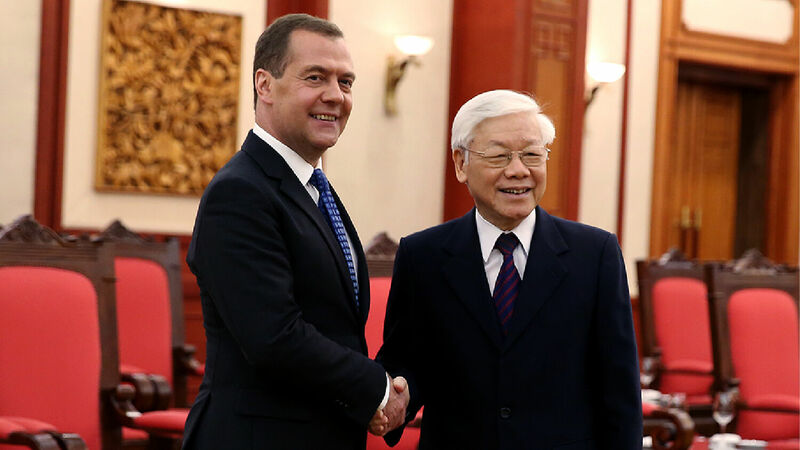 Russian Prime Minister Dmitry Medvedev (left) and Vietnamese President Nguyen Phu Trong attend a bilateral meeting in Hanoi on November 19. Relationship indicates how Russia will lead Asian nations. Russia and Vietnam will triple bilateral trade to $10 billion by 2020, according to statements by the nations’ prime ministers on November 19. Trade between the two nations reached $3.6 billion last year. Vietnamese Prime Minister Nguyen Xuan Phuc echoed Medvedev’s remarks. “We have agreed to cooperate more closely and effectively implement a free-trade agreement Vietnam has signed with the [Russia-led] Eurasian Economic Union,” Phuc told reporters in Hanoi after holding talks with Medvedev. With other Asian nations joining in, you quickly reach combined populations of 3.5 to 4 billion people! Scholars generally agree that “Gog” is Russia, and that “the land of Magog” includes China. The descendants of Meshech and Tubal have been found together throughout history. In Assyrian and Greek histories, Meshech appears as Musku, Muski or Mushki—all names related to the Russian spelling of Moscow. … What about Tubal? On the eastern side of the Ural Mountains lies the city of Tobolsk, named after the Tobol River, a name derived from Tubal. Tobolsk was once the seat of Russian government over Siberia and was basically considered Russia’s Asian capital. Vietnam’s warm relations with Russia could lead to it joining the Russian-led “kings of the east” alliance. With Vietnam’s large population, it could end up contributing to the 200 million-man army. Keep watch as Russia continues to deepen relations with Vietnam and other Asian nations. Keep watch as Russia spearheads the biblically prophesied “kings of the east” alliance. To understand why Russia is the leading power of the “kings of the east” alliance, please request your free copy of The Prophesied ‘Prince of Russia,’ by Gerald Flurry. This booklet explains how Russia will play a key role in fulfilling major Bible prophecies. It also proves why Russia will end up as the head of the 200 million-man army.